On July 06, officials from Tambaram Municipality, Chennai seized nearly one tonne of “wax polished” apples from the main market and destroyed them. Waxed Apples are unsafe for consumption. Waxed apples imported from U.S. are safe for consumption. Apples imported from U.S. are waxed and waxing is done to prevent moisture loss, to enhance firmness retention and to slow down the apple respiration rate. 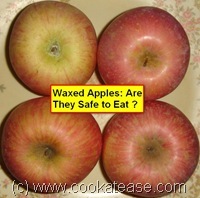 Waxing of apples is done as per U.S. Food and Drug Administration (USFDA) regulations. Wax applied is generally Carnauba wax, a substance of plant origin. One apple has a drop or two of wax as surface coating. How to eat waxed apples ? Apples must be washed before eating. Use a vegetable brush to scrub the surface in tap water. Soap or detergents are not to be used for washing. These waxes are also approved for use as food additives for candy and pastries. This is the reason why chocolate bars melt in your mouth but not in your hand. Why waxed apples were seized and destroyed at Tambaram, Chennai ? As imported waxed apples are sold in the market, local vendors procured apples from Tamil Nadu, other States and polished them with wax used for making candles. They even affixed stickers in each apple to look like imported apple. Where to buy genuine imported apples ? Do not buy from roadside vendors. Buy only from bigger outlets like Reliance Fresh, Fresh @, Spencers Daily. Waxing of apples is done as per U.S. Food and Drug Administration (USFDA) regulations. I don’t know whether Indian government has approved this. These apples are sold in India. Are apples produced in India and coated with wax are safe to eat ? Pour boiling water to remove wax coating ,rather than scrubbing.